Update! I have changed my yearly preparedness prep lists and put them in The Food Storage Organizer which you can download and print. It's on my new website, FoodStorageOrganizer.com. It costs $12, and you can print for yourself or others. But you cannot share or email the file. Hello friends and Happy New Year! It's time for us to roll up our sleeves and work on our New Year's resolutions; become more self-reliant and prepare for emergencies. If you want to use my January Emergency Prep List, follow this schedule - Week 1: December 27, Week 2: January 3, Week 3: January 10, Week 4: January 17, Week 5: January 24. Update our 2-week supply of drinking water. Add beverages to our 3-month food storage supply. Stock up on toiletries like toilet paper, soap, shampoo, feminine items and deodorant. Gather dry milk recipes on Pinterest for me and you. Take an inventory of the freezer, beverages, water, toiletries, and breakfast foods. Holy cow! Since I wrote these goals down on this post, it was so easy to copy and past them as tasks on my Google calendar. So excited for this new year to begin! Gathering drinking water is one of the preparedness steps taught by the The Church of Jesus Christ of Latter-day Saints in their Home Storage program. FEMA recommends you buy 14 gallons (1 gallon per day for 2 weeks per person) of commercially prepared bottled water. To learn how to purify water and other good things, read this FEMA/Red Cross document "Food and Water in an Emergency." Personally, I keep a few barrels of water in our basement AND small bottles of commercially prepared water in my kitchen, emergency closet and garage. I buy 24 ct. cases of water because I can carry them myself. So, if we ever had to evacuate, got water? I'm always surprised why people won't buy emergency drinking water when it costs about $14 per person, but they will buy 2 movie tickets for the same price. Mmmm. Want to Know How To Buy Emergency Water Quickly? Get in the car and drive to the store. Buy 4.4 cases of 16.9 oz. bottled drinking water. Bring them home, put them under a bed, or in a closet. You're done! Yes, it can be that simple. While you are on a roll, how about starting a financial reserve (aka emergency fund)? This is also taught by the LDS Church and financial gurus like Dave Ramsey. It's so easy to do. I know you're thinking it isn't easy because you just spent mucho dinero on Christmas gifts. But I know you can do it! Decide on a small amount of money to save each week. Put it in the bank or a jar on your dresser. And ONLY use it for emergencies. Read how here. I'm amazed how large our fund has grown over the years. I have a testimony that obedience brings many blessings. So, do it! 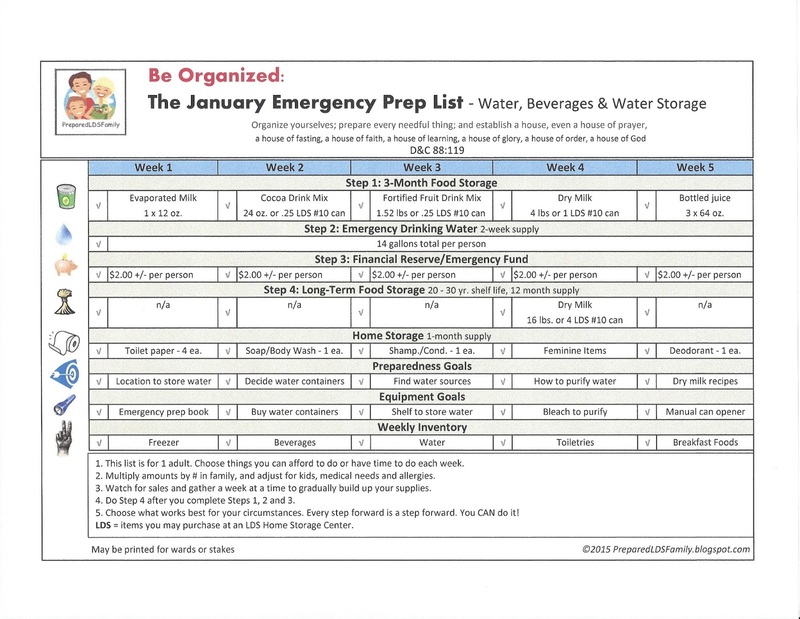 Print out the January Emergency Prep list with the link below and see if there are some goals you can work on. I don't do everything either, but they give me some place to start. I studied Utah grocery store prices for the past 7 years, and tried to balance my lists so they doesn't blow our budget. Whether you live in Utah or not, I think my lists will help you move forward. "I have been quoted as saying, 'Do the best you can.' But I want to emphasize that it be the very best. We are too prone to be satisfied with mediocre performance. We are capable of doing so much better. We must get on our knees and plead with the Lord for help and strength and direction. We must then stand on our feet and move forward." So, let's get on our knees, then on our feet and move forward this New Year. You CAN do it! 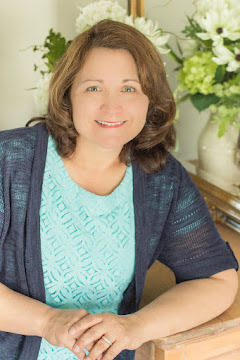 If you are new to Prepared LDS Family, go to my Start Here page and learn how I do things around here. Each month I share a list of items to gather for food storage and emergency preparedness. I've tweaked these lists over the years and have found that focusing on monthly goals will not overwhelm us. On your list for January under emergency funds, it says 2+pp . Could you explain the pp . Yes. In fact, I will make the change on the sheet as well. I suggest saving $2 per person each week. The plus sign means you could add more to the fund. Everyone's financial situation is different, so you could also save less. I love this printable checklist...it gives me something specific I can focus on each week. I will definitely be checking back often. We had a preparedness class several years back where we were told the 16oz bottles only last a good 6 months. Do you know anything about this. Couldn't find anything on way or the other. No, I have not heard that. FEMA recommends commercially prepared water. I usually use mine up in a year, but would be fine longer if needed. I also should have said, that using some, buying some more, helps rotate your water. I buy a few cases every few months to replace those we used. Thanks for sharing and for moving fitrward in spite of the obstacles. Carry on! I look for your montly preparedness lists every month. Is that somethig you will continue to do into 2014, or did you intend that the ones you made up for 2013 would be repeated? We have been buying our bottled water mostly at CVS - the price fluctuates but it is usually on sale for $3, and I've been seeing $2.22 a lot lately. This might depend on the area, though. I'm at CVS often for prescriptions, and the water is a great buy with my ExtraBucks. I love your monthly lists. Thank you so much for doing them. And thanks for making the water issue so simple and blunt. I'm going to buy my flats today. Why don't you store the water directley on the cement floors? but on the January List it says 3.00 64 oz. Just want to make sure which it is. Thanks! Hi Missiz B, thanks for catching that. It's 3 x 64 oz. for 1 person. Basically 1 bottle for each month. Just a back up since it's more expensive than powdered drinks. Thank you! Sorry for the late response. I have to change my settings so that google notifies me. Hi ive been trying to access the pdf for januarys preps but i keep getting a google terms of service infringement notice, is there any other way of getting hold of it? I cannot get access to the .pdf for January. Permissions?? Thanks! I love your blog! Try the pdf again. Thanks! I love your blog. It inspires me and helps motivate me when I feel overwhelmed. I've missed you these past months and am so glad you are back on your blogging feet! Thank you for the effort you put forth on the behalf of so many. Welcome back! Hi Ronda, Because someone tried to sell my lists, I've had to use different rules for 2017, and hope others will honor my modified copyright. You may download the document and print copies for sisters interested in them. Or share a link to my website, and members can purchase a copy to download themselves. But you cannot download the document and share it through email. I'm so sorry.